CARACAS, Feb 17 2014 (IPS) - Violence on the streets of Venezuela, with anti-government protests in the capital and 12 other cities, is a sign of hardening stances by both the government and its opponents as President Nicolás Maduro takes a trial-and-error approach to the economy in crisis. Opposition student protests continued over the weekend in Caracas and other cities, while on Saturday some 15,000 pro-government supporters turned out for a peace demonstration called by the president. Opposition leader Leopoldo López has an arrest warrant out against him, but he called on government opponents to join him in another march on Tuesday, Feb. 18, to the interior ministry, saying he would be available to the authorities and had nothing to fear. Three people, two students and a member of a pro-government militia (known as “colectivos”), were shot dead at the end of marches in Caracas on Wednesday Feb. 12. There were dozens injured and some 100 arrests, with complaints that detainees were being held incommunicado, tortured and treated inhumanely. The protests, paradoxically, began with students complaining that insecurity and violent crime on the streets were invading their schools and universities. “We are facing a coup d’etat against democracy and the government I preside over,” said Maduro, who was elected in April to succeed the late Hugo Chávez (1954-2013), in his first speech after hearing that unknown persons had fired on dispersing protesters in central Caracas. The president accused “ultra-rightwing fascist groups” that he said were following “the same script as in April 2002,” when a huge opposition march in Caracas ended with shootings that left 19 civilians dead and sparked a brief coup against Chávez. On Sunday Feb. 16, Maduro announced the expulsion of three United States consular officials, accused of conspiring against his government, and criticised Washington harshly after Secretary of State John Kerry expressed “deep concern” over the situation in Venezuela and asked for the release of the arrested students. “The circumstances now are different, and the government either does not know where it stands, which is hard to believe, or is using the outbreak of the crisis to justify the suspension of constitutional rights and govern under a state of emergency,” sociologist Carlos Raúl Hernández, who teaches a doctorate in political science at the Central University of Venezuela, told IPS. Venezuela has one of the highest inflation rates in the world, at 56 percent, and over 70 percent in food prices, as well as a severe shortage of basic products, ranging from milk and flour to toilet paper and newspapers, and including medicines, air fares, industrial inputs and car parts. State controls are increasingly tightened on access to foreign exchange earned by oil exports, and inspections are made and fines levied on commercial and industrial firms. For its part, the business community is demanding payment of millions of dollars in debts acquired under the exchange control regime. “We are living in the turbulence produced by the discontent and unmet demands of Venezuelan society, which have been gathering force in recent months as a result of long term economic and social upsets,” said López Maya. With the backdrop of this discontent, the students received support from other citizens when they began their protests in early February in the southwestern Andes. Three young men, accused of attacking the regional governor’s residence, were sent to a prison in Coro, in the extreme northwest of the country, pending trial. 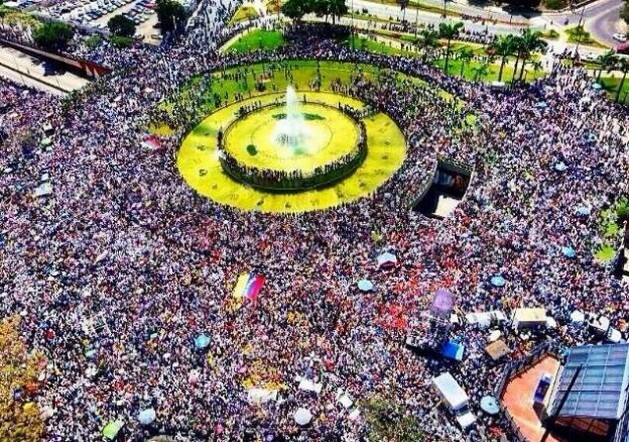 Leaders of a sector belonging to the opposition coalition, the Mesa de Unidad Democrática (Democratic Unity Roundtable), called for mass protests on Wednesday Feb. 12, the bicentennial of a battle in the war of independence against Spain in which young students joined the patriot army and achieved victory. The date is celebrated as Youth Day, charging the demonstrations and their violent end with emotional and political overtones. On Friday Feb. 14, while street protests continued in Caracas and other cities in defiance of Maduro’s announcement that demonstrations would have to have prior authorisation, it was reported that the young people imprisoned in Coro had been released. This may be a first step towards taking the pressure off the protests, and it coincides with many calls from the international community supporting dialogue and respect for the human rights of all involved in the Venezuelan political conflict. In Venezuela, human rights organisations like Provea and the Red de Apoyo por la Justicia y la Paz (Justice and Peace Support Network) emphasised the need to investigate and punish those responsible for the deaths and injuries that followed the protests on Feb. 12. Journalists on the ground documented with eyewitnesses, photographs and videos how allegedly pro-government “colectivos” burst in, stirred up violence and used firearms in areas where people were shot. In dispensing blame, Maduro accused international media of instigating violence through their reporting and opinion on events. He suspended the Bogotá-based news channel NTN24 from cable TV and delivered a harsh warning to the French news agency AFP. In spite of the vividness of the images, Hernández does not believe that the protests will lead to significant political change. Instead they may only stiffen the positions and cohesiveness of the parties in conflict. “Mass movements only achieve major political change when they are combined with powers that can bring about a military uprising, and this is not about to happen in Venezuela,” Hernández said. “From this point of view, they are street games without a clear end in sight,” he concluded.